Even though Wonders does have some vocabulary practice activities, I still like to use Quizlet to introduce new words, review key vocabulary, and of course play Quizlet Live. Quizlet works seamlessly with both Google Classroom and Remind, two other applications that I use on a daily basis. Over the past two years, I've made Quizlet sets for most of the units that I've taught, splitting up the spelling and the vocabulary. I've even added review words from previous sets to allow us to do Quizlet Live. This leads to a highly interactive and fun way to introduce new sets of spelling words. As students arrive in the morning, they are invited to preview the words; when the announcements are over, we start the day with Quizlet Live! I'll be updating some of these over the weeks to come to get everything ready and in one place for the coming school year. If you use Quizlet for vocabulary and spelling, drop me a line to let me know! Our sixth grade science curriculum has shifted to covering more of the middle level earth, space, and atmospheric science standards. Last year, I worked with this by adding a new science starter for the fall months: hurricane tracking. Tracking these storms is important for the classroom in several ways. First, every time we track a storm, students build their geography skills, practicing using latitude and longitude to find a location. In addition, tracking storms adds a real-life current events component to science class. Students see firsthand how science techniques like collecting and analyzing data are important to everyone! 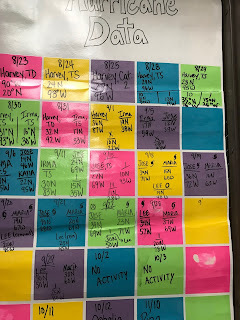 I also like to use the technique of tracking storms because it helps students to work with a topic over a period of time. It's not just a one-day lesson, but an ongoing synthesis of data and ideas. I have several items in my classroom to help me track hurricanes. At the start of the school year last year, I made a list of the Atlantic basic hurricane names for the year. (Future lists) Next year, I think that I will add the Pacific basin as an extension for students who work quickly and would like an extra challenge. One thing that I always fix up when I make copies is to make the latitude and longitude markings a little larger, as sometimes kids say that they have trouble reading the tiny numbers. I also include a Know-Wonder-Learn chart in my booklets, as well as a listing of hurricane intensity categories. We quickly fall into a daily routine of hurricane tracking. I start the class by projecting the Active Tropical Cyclones page from the National Weather Service. Last year was an active year, so we had lots of storms to track! I wrote the latitude and longitude of the day's storm or storms on the board, and students found those coordinates and marked them. Some liked to use multiple colors to mark storms, while others found a pencil to be sufficient. We put the date and the name of the storm in small writing next to the storm. I kept track of the data on a chart in the classroom so that students who missed a day could quickly catch up. The question of whether to track tropical disturbances comes up frequently. In most cases, I leave it up to the class. If a disturbance has less than a 30% chance of developing, then we usually don't mark it. But sometimes students want to record the information, especially if there aren't any other active storms that day. As students become more independent with the routine and depending on our other activities for the day, sometimes they do visit the NHC website and record the information on their own. There are many other educational activities on the site for students to explore, and they enjoy bringing new information to share with the rest of the class. Students quickly notice the difference in markings between a tropical disturbance, a tropical storm, and a hurricane. (Here's a reference if you're curious.) They begin to use these different notations in their own tracking charts. With the document camera, I can project the hurricane charts of several students so that we can discuss what they have in common and what they may want to work on. Students also start to notice that most of our Atlantic hurricanes start off the coast of Africa. This leads them to make hypotheses about the tracks of future storms. When some storms don't act in the ways that they expect, students begin to wonder about what other variables may be influencing them. I always approach hurricane tracking with a questioning frame of mind. I'm not at all an expert in meteorology, but I've learned a lot from three years of hurricane tracking! There is definitely an emotional side to tracking storms. Located as we are in Pennsylvania, severe storms rarely reach us. However, students are still anxious about the impacts of storms. It's tough to stand in front of the classroom and discuss with students whether a tropical disturbance will turn into the named storm Maria one week and then watch it wreak havoc the next. As I remind students, though, these things will happen whether we track them or not. Knowing about the storms and being a fully informed citizen helps to make severe weather less scary in the long run. On days with no storms, we build background knowledge with videos and lessons. Here is a playlist of my favorites. I'm always working on introducing vocabulary words in new and interesting ways. To me, looking at words with readers is so important for building reading success. 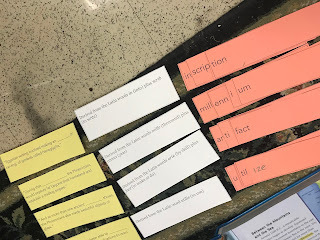 We talk about the words; we talk about how the words are used in the text; we talk about how the words relate to the overall meaning of the text; we talk about how we might use these same words, both in talking about the text and in creating our own ideas. Sometimes I use speed drills to introduce new words. When I have some more time, however, I like to create a matching activity. 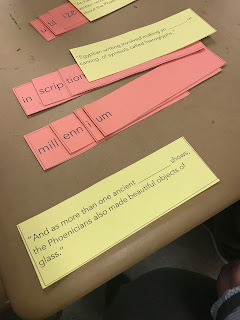 This activity does take some preparation, but it pays off huge dividends in getting readers to focus on and talk about new words and how they fit into a bigger text. I like to choose words based on several criteria. First, I look for high-utility academic words--some sources call these "Tier 2" words--that are likely to be found across multiple texts. Several years ago I took the original word list from Averil Coxhead's research and put it into a spreadsheet, with information about word roots and phonograms. You can access the sortable list here. In the case of the example to the right, I used words from our basal curriculum. 2. Create syllable cards for each word. Early in the school year, I use the QRI word reading test and noticed that my students had trouble decoding difficult multi-syllabic words. Showing students how to break words into syllables--divide and conquer, if you will!--helps them to approach new words with confidence. I used Microsoft Word to create syllable cards for each word. To make the cards more manageable, I formatted them to overlap a bit to form the word, as you can see with "inscription" to the right. For struggling readers, you may want to paperclip the syllable cards together for each word; other readers may enjoy the challenge of sorting out 50 or so syllables. 3. Create definition cards for each word. I used fairly simple definitions for the words, and formatted the table cells to make the cards all the same height. 4. Take the sentences from the text that use each word and type them into your cards, leaving a line for each target word. This step ensures that students work with putting the meaning of the words back into the text, an important step. I love report card envelopes for storing my reading manipulatives. When I did this particular activity with students, I arranged students in mixed ability groups with the plan that all students would be engaged in strong conversations. They were! I emphasized reading the definitions, words, and sentences aloud to each other. As I circulated to peek in at groups, I asked them questions like, "What do you think you're going to read about in this text?" and "How do ____ and _____ relate to each other?" This isn't just a pre-reading activity, either. Students used the cards after reading the text as well to build automaticity and fluency. In this case, they could use the text to reinforce the meanings of the words, for example pointing to pictures of inscriptions in the text. A fourth set of cards including the word roots and etymology expands this activity. I introduced these to groups that needed some extra enrichment. 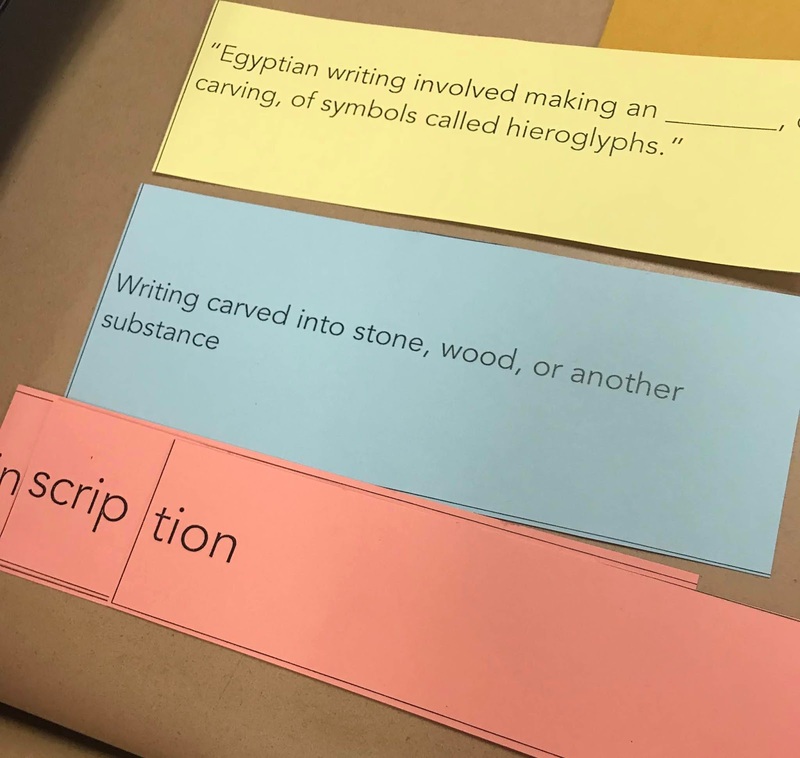 Although it is time-consuming to prepare, this activity yields big benefits in helping students to decode and use high-frequency academic words! 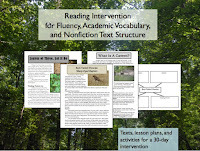 If you're looking for a structured approach to academic vocabulary, you might enjoy this reading intervention set! In my previous post, I wrote about my first two years of experience with the Wonders reading program. Here, I'll discuss some of the strategies I've used to build on the strengths of the program and make it fit into my own classroom. I have a sweet situation for my ELA instruction, with 90 minutes of reading instruction in the morning plus 40 minutes after lunch for grammar and writing. I co-teach with a special educator, which is amazing! We start with about 20 minutes of independent reading as the day is getting started. Then, after a 15-20 minute minilesson, we break into small groups. Kelly takes her quarter of the class and I work with the rest of the group--18-24 readers, depending on the year and class size. I break up this group into three smaller groups and rotate among them. To minimize transitions, I'm the one who physically moves for instruction, although the kids are free to work wherever they like when I am not with them, and they sure do like to move around! What I do with the small groups depends on what we're working on at the time, what students seemed to be need help with, and what we really loved talking about. My rotations usually involve some reading, some fluency work, word work, and comprehension questions. Which brings up the question...what do kids do when they're not with me? The fluency passages that go with each week's instruction are usually pretty interesting, and sometimes groups work on these. I also intersperse some of my own Readers Theatre scripts, like Story Elements Readers Theatre or Text Structure Readers Theatre. The Close Reading Companion by Wonders is meant to be a resource for teachers to help lead in-depth conversations of the texts. I have a colleague who loves it. Personally, I can never figure out what to put on those lines, and when I do know what should go on them, there's never enough room. Instead, I've started making some of my own packets to go with the stories. In some of them I use a speed drill to practice key vocabulary; in others I write my own multiple choice questions, usually mirroring those in the Weekly Assessments. Here is an example of one of the packets that goes with "Into the Volcano" in Unit 1. I don't just hand out these pages as worksheets. Instead, they guide student discussions, and we enjoy the conversations that we can have. But putting the important questions on paper helps immensely with co-teaching and when there is a substitute! As I wrote in a previous post, the spelling component of Wonders doesn't blow me away. I've found that making a page that includes the spelling words, vocabulary words, and some extra activities builds our learning. These little additions make teaching with Wonders so much easier and more enjoyable! What changes have you made to your own reading programs? At my Independent Reading Workshop, many teachers were interested in adding accountability to independent reading. Often, I just walk around the room and check off on my clipboard the books that students are reading, and end it there. Once a month or so, I enjoy working with students to gain a deeper insight into their reading. This Independent Reading Letter assignment is a fun way to do this. Complete these in the classroom! You will have much better results with this if you provide class time for the assignment. When I do it, I circulate to talk with students about what they are writing. Share with students: Students love sharing their letters with each other! One month you can mix it up by having students write their letters to one another. Today I got to present with the Adams County Teaching and Learning Conference! It was exciting to get together with fellow teachers for a day. I presented on the topic of independent reading. Structured time for students to read during class has been an important piece of my instruction ever since I started teaching (waaay back in 1997!) I've never presented about it before, however. Why not? I never feel totally comfortable with how I implement independent reading. Each year I make small changes as I consider whether my classroom was too structured or not structured enough or whether I didn't hold students accountable or whether I sucked the joy out of reading. This level of existential discomfort, however, is vital to teaching reading. I think that the day I decide that everything is "just right" will be the day that I am done as a classroom teacher! I need to learn how to embrace that uncomfortable feeling and keep making small changes as I adjust to each new group of students. Speaking of an uncomfortable feeling...I didn't have my Mac adapter to plug into the Promethean board, so I used the handy PC computer that was already connected and just signed into my Chrome account. No problem, right? Except that the computer RESTARTED twenty minutes into my presentation and took the entire session time to look for updates and finish. Ugh! Luckily I could talk forever about books and reading, but I don't think the participants were impressed. Here is a list of my favorite classroom books for independent reading! Anyone else have a presentation fail to share? The process of adopting the anthology was pretty painful, and everything that I'd ever created for curriculum was cast aside, publicly and loudly. Ouch. The learning curve to assimilate all of the new materials was steep. I like to really think deeply about a topic before writing about it. For like two years. Everything I say here will be based on the sixth grade Wonders materials, which are the only ones to which I have access. I've done two (maybe three?) days of in-service work with the official trainers, and I've used the program for two years. The Wonders series is based on two different books: The Reading-Writing Workshop book, and the Literature Anthology. Each of six units has six "weeks" of curriculum written for it. Each week focuses on an essential question, and has several selections associated with it, often of differing genres. The Reading-Writing Workshop selections are designed to be shared reads. These are uncredited texts that use the eight vocabulary words for the week, and often I find myself admiring these anonymous authors who managed to work the necessary words into an unrelated text. They range in quality from meh to surprisingly good. The selections in the Literature Anthology are, naturally, the longer texts that hold the meat of the program. These include selections from novels such as Elijah of Buxton, A Single Shard, and Home of the Brave, as well as magazine articles and other nonfiction selections. Reading lessons are included in the Reading-Writing Workshop book, and there are many close reading questions for the literature anthology selections in the teachers guide as well. Each week ends with a Weekly Assessment that consists of two uncredited selections, nine multiple choice questions that reflect the week's lessons to a degree, and one text-dependent analysis question requiring students to compare the two texts. Of course there are scads of other resources that come along with the program, including leveled readers for guided reading, grammar worksheets and assessments, fluency reproducibles, diagnostic and placement tests, a close reading companion, an interactive version of the text for struggling readers, and then everything online as well, et cetera et cetera. The best part of this program is the quality of the literature selected for the Literature Anthology. The sixth grade texts have a dizzying variety of form, style, and genre, and many are from well-known authors. The publishers didn't stint on the illustrations, either. For example, an excerpt from Linda Sue Park's A Single Shard is gorgeously illustrated in context-building paintings created especially for the series. Readers can't help but turn the pages to see what happens next! Nonfiction texts, like Into the Volcano, are accompanied by diagrams, maps, and sidebars. It is easy to find an entire year's worth of instruction in the pages of the anthology. The texts are meaty enough to yield multiple interpretations, and the text pairings can lead to interesting comparisons. The connections between the uncredited texts in the Reading-Writing Workshop and the texts in the Literature Anthology are pretty solid. The Reading-Writing Workshop texts are written to be accessible to most readers and used to introduce key concepts, and as a whole they are well-written and interesting. As with the Literature Anthology, the RWW texts are beautifully illustrated and formatted. The Weekly Assessments are reasonably good as well, and give teachers far more than enough materials for ongoing assessment. The online testing system works well and makes grading much easier! Vocabulary words are well-chosen. Last year, I had a classroom economy running, and "paid" students $50 to find vocabulary words in the context of their independent reading books. The incidence of the program vocabulary words in grade-level literature was astounding! This showed me that the words taught in the program are words that readers are likely to encounter and totally worth the time spent teaching them. My biggest issue with the Wonders series is the issue of time. It is absolutely impossible to finish the program as described. For example, a 15-page story excerpt called "Roman Diary" is meant to be taught, read, and discussed in a single day of instruction. This is the norm, rather than the exception. Each of the amazing Literature Anthology texts is blocked for one day of instruction. My readers have varying reading rates, of course, and even with an incredibly generous reading block of 2 hours we can't make this work. I don't think I'd want to do it this way, either. Strong works of literature require time for the reader to consider and think about the author's choices; racing through them does no one any good. This is especially true for the upper grades, in which the goal of reading becomes slowing down and considering the author's choices. Of course the facilitators at the workshops are quick to say, "Make it work for you!" at the same time that they talk about keeping pace and moving quickly through the program. It's telling that the online planning program will not allow you to make a lesson block longer than 6 days. Instead, to make your days line up correctly, you have to add "Non-teaching days"...even if those days are definitely going to be spent teaching! This sends a message to teachers, especially newer teachers who don't have as much confidence in their choices. It's easy for me to say, "I'm teaching this amazing text about the Great Chicago Fire, and we will work on it for four days because there is so much to explore here!" A first year teacher, however, might feel pressure to race through and miss those great connections. Another small quibble has to do with the Benchmark tests. There are three Benchmarks to be given at intervals through the year. Like the Weekly Assessments, these are uncredited texts written for the program. I would like to see stronger texts for these tests, especially as there are so few of them! The spelling and grammar segments are weak, with an emphasis on really dull worksheets. Given the strength of the other components, I'd have loved to see stronger lessons with more sentences and examples pulled from the included texts. 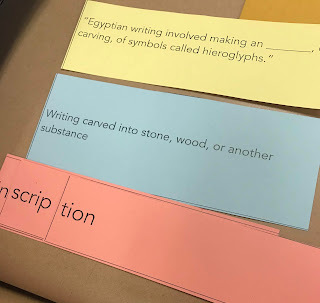 As students move through the series, I also notice that the program's emphasis on text-based essential questions--"What was life like for people in ancient civilizations?" --leads to a lack of knowledge about literature terms. Even though text structure is taught throughout each year, my students had trouble generating a list of text structures this year. Now that I'm aware of this issue, I can easily work to fix it. In my next post I'll talk about what I've done to add to the program this year. Have you adopted a basal series in the past few years? What was your experience like?